"I'm concerned about the health effects that this product poses." When Robert Ross has to use the cleaning solution OxyCide as part of his job as a housekeeping employee at UPMC Magee-Women's Hospital, it's not a pleasant experience. "It burns my eyes, it makes them water. It burns my throat," says Ross. "The best way to describe it is it's like working with onions. You have no relief, unless you take a break and go some place that's well ventilated so you can get some air." 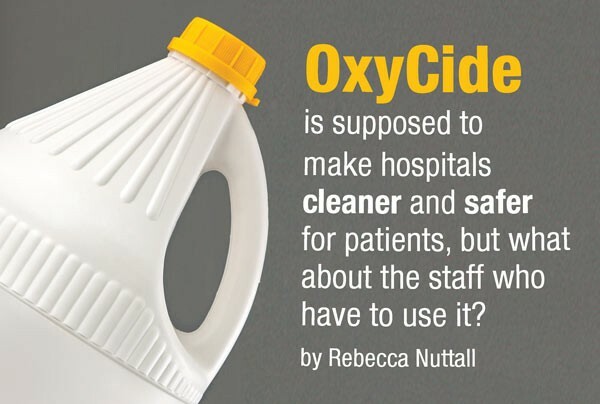 OxyCide, a relatively new hospital-cleaning product, was selected as the primary cleaning solution in nearly 20 UPMC facilities last spring. Since that time, some employees say they and their co-workers have experienced a number of adverse side effects when using the product. "A lot of my co-workers have complained about respiratory issues, like they were having trouble breathing. A lot of them would complain about their eyes being irritated," says Justin Sheldon, a housekeeper at UPMC Presbyterian Hospital. "I'm concerned about the health effects that this product poses to not only my coworkers, but to the patients." Last month, Sheldon filed a complaint about the hospital's use of OxyCide with the Occupational Safety and Health Administration, a federal agency that regulates workplace safety. Officials at OSHA's Pittsburgh Area Office tell City Paper that it "opened an inspection" of UPMC on Jan. 22. The complaint raises questions about the use of toxic chemicals used to clean health-care facilities, where powerful products are necessary to kill the germs and bacteria that can cause infection. According to Ecolab, the makers of OxyCide, the product has proven effective at killing infection-causing "clostridium difficle spores." According to a recent study in the Journal of the American Medical Association, treating C. difficile infections cost the health-care industry $1.5 billion each year. And UPMC isn't alone in its use of OxyCide. The chemical is also used at facilities that are part of the Allegheny Health Network (which includes Allegheny General and West Penn hospitals). After confirming that OxyCide is used in Allegheny Health Network hospitals, a spokesperson did not respond to additional questions about the product's use in these facilities. So how do hospitals weigh the costs and benefits of cleaning solutions in an effort to ensure both patients and employees are protected? In the case of OxyCide, employees say a product that is supposed to keep patients from getting sick, is making them sick. When OxyCide hit the market in 2013, it was advertised as a non-bleach alternative cleaner for daily use in health-care settings. According to a 2012 study, the use of OxyCide resulted in a 36.5 percent reduction of bacteria on hospital surfaces when compared to other disinfectants. In a statement from Ecolab in response to an email from City Paper regarding the OSHA complaint, spokesperson Roman Blahoski said OxyCide "is an EPA-registered product that has undergone rigorous testing for use in health-care environments." According to the Centers for Disease Control and Prevention, approximately 1.7 million people acquire health-care-associated infections annually, resulting in 150,000 deaths. Infections caused by C. difficile are linked to 14,000 deaths each year. "OxyCide is proven effective against several harmful bacteria and viruses that are known to cause health-care-associated infections," says Blahoski. "Hospitals across the country are finding that OxyCide is a key component of their programs to battle health-care-acquired infections." This criteria factored into UPMC's decision to use the product locally. "We are committed to maintaining safe, sanitary facilities for our patients and employees," says UPMC spokesperson Gloria Kreps. "Ecolab, the manufacturer of OxyCide, represents that OxyCide is an EPA-approved cleaner that is safe when used correctly and reduces patient exposure to dozens of dangerous organisms. We have no reason to doubt them." In response to the OSHA complaint filed by UPMC employees, Kreps says, "Though it is true that the product has a vinegar-like scent, we believe it is the right thing to do for our patients." And added, "As with any product, its safe use by our employees is of utmost importance and any issues regarding its safe use are investigated immediately." OxyCide is advertised as a safer alternative to other products because it is dispersed from a container that eliminates the need for manual pouring and mixing. The product gets dispensed via a container that dilutes the chemical solution with water. But even diluted, employees say, the disinfectant is powerful. In an employee-conducted survey of 244 UPMC workers, 81 percent of respondents indicated they had suffered negative effects from OxyCide. The most common effects were a runny or burning nose, which was experienced by 56 percent of respondents; and headaches, which were experienced by 50 percent. In addition, 6 percent reported other effects, including nose bleeds and vomiting. "[OxyCide is] so dangerous. It's putting a lot of us at risk, and not just the health-care workers, but doctors and patients as well. It's about everyone in the hospital," says Ross. "Everywhere this product is being used it should be gotten rid of."